It’s been almost five years since I wrote about my favorite gin, Bombay Sapphire, and four years since my positive gin experiences doubled when I tried Hedrick’s gin. Then, gin was getting the short shrift in the liquor store. Flavored vodkas—as if there should be such a thing—were dominating the shelf space, with and tequila and flavored rums squeezing in. Now, whiskey is the dominant spirit, but, lo and behold, gins are proliferating at quite a clip. I imagine that the complexity of whiskey has emboldened the palates of drinkers to the point where juniper and heat no longer scare them away. Photo composite of images from originating sites. I came across Bulldog gin at a friend’s party. Chilled and alone, it was perfectly fine to sip, and paired with tonic water, it was sublime. It’s very smooth, and the juniper is held in check by a compliment of botanicals that play well together. In particular, I was able to taste the coriander, a woefully underused spice with a sweet lemony kick. (As an aside: Coriander is the fruit of cilantro. The herb and the spice taste nothing alike, and those that despise cilantro won’t find the soapy taste within the seed. In other English-speaking countries, cilantro is called coriander and coriander is called coriander seed. Why America wants to confuse the relation between the two is beyond me.) Bulldog, an English gin, was first launched in New York, so my friend was in the vanguard when he purchased it. Now available worldwide, it’s worth looking for. Is New York a hub for good gin? In my limited purview, it’s a great place. Brooklyn, in particular, is producing two astoundingly good gins. Breuckelen Distilling is notable for its superb wheat and rye whiskeys—more on that at another time. But its gin is a standout, with an earthy, herbaceous flavor, from rosemary backing up the juniper berries. Citrus notes are supplied by lemon and grapefruit, rounded off with the sweet spice of ginger. Many gins boast of the amount of botanicals, implying more is better, but Breuckelen’s Glorious Gin works magic with just the five, each one providing comforting familiarity while producing a complexity of flavor. 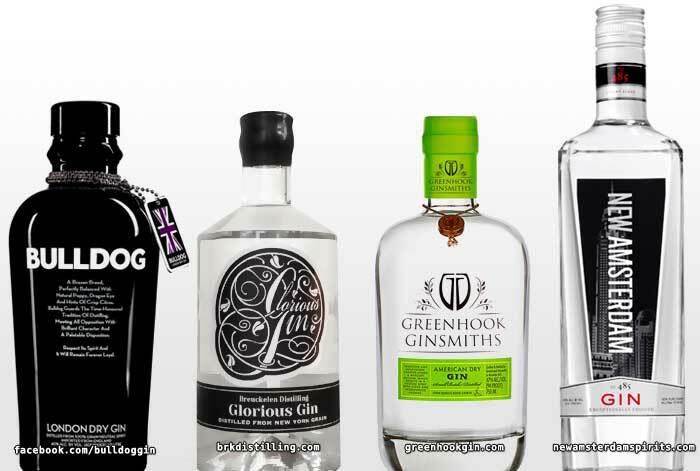 Then, when I ask for recommendations, there is the gin that is always named by those that know their stuff: Greenhook Ginsmiths American Dry Gin. It’s a killer gin. Smoother than a 94-proof bottle has any right to be, Greenhook’s gin is spiced with nine botanicals, including elderflower, my currently favorite flavor. It’s exotic, but not alien. It’s welcoming in scent and buttery on the tongue. It’s a gin that can get prodigal gin drinkers back into the fold, and make the gin-wary into fans. It works beautifully with lime, which is just about the highest compliment I can pay any liquor. I get Bulldog and Breuckelen’s Glorious Gin quite often, but in between each, I’ll buy another bottle of Greenhook. There’s something that each of these gins have in common—they all start with wheat as the grain used to create the mash for distilling. Knowing the little that I know of chemistry, I can’t wrap my head around what a difference the grain makes, but corn mashes fall flat on the tongue, where as these three wheat distilled gins all have a wonderfully velvety, buttery feel. I’ve become a grain-snob because of these three. Also, I’m a fan that I can usually find each of these for less than $40. Gin’s prices haven’t spiked the way whiskey’s has. And yet, I am stingy. My penny-pinching leads me astray. For $18 I picked up a bottle of New Amsterdam gin. New Amsterdam is less forthcoming about its ingredients, with its website noting that it’s “crafted with botanicals, citrus elements and a light touch of juniper.” The citrus elements taste like someone dropped a bottle of St Joseph’s chewable children’s aspirin into the gin. The sweet, not-quite-orange flavor is close to undrinkable. At half the price of the other gins, it still is not worth it. I’ve found some mixers that support, or mask, the odd flavor, but it will take me a long time to finish. I’d almost think that it’s better to stick with what I know and buy reliable brands. But if I did that exclusively, I wouldn’t have tried the Brooklyn-based gins, sticking to my Bombay Sapphire. My world would have been smaller for it. I won’t let the one bad choice stop me from experiencing the growing world of artisanal gin. ← QnA with DnU: Paul Carlin from Long Beard Brewing Co.
Oh Bulldog! I forgot about bulldog. Thanks for the reminder!